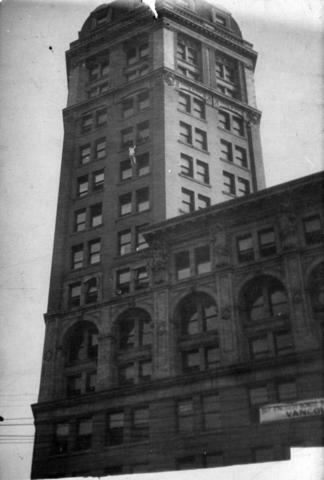 We often hear about Harry Houdini doing his escape act at the Sun Building on Pender Street in 1923, where he was suspended from the third floor and wriggled free from a straight jacket. But before him was Harry Gardiner the “Human Fly” who visited Vancouver in Novemebr 1918 to scale the walls of the World Building, better known today as the Sun Tower. Gardiner began climbing in 1905, and successfully climbed over 700 buildings in Europe and North America, usually wearing ordinary street clothes without special equipment.